Mangaluru, Dec 16, 2015: Years after people’s hope to have KSRTC - Karnataka State Road Transport Corporation city buses from State Bank of India bus terminus will become a reality as it will operate buses on three routes among 18 permitted, from Dec 16, Wednesday. The low-floor buses will be operated from the funds sanctioned under Jawaharlal Nehru National Urban Renewal Mission. The three destinations from State Bank of India bus terminus will be Mangalpet via Baikampady, Someshwara via Thokkottu and Mudipu via Madyar. According to a senior official in the Mangaluru division of the KSRTC buses would operate on two more routes from December 19. The official said though the Regional Transport Authority, Dakshina Kannada, permitted it to operate on 18 routes, the KSRTC will operate buses on 17 routes before the end of this month. The KSRTC has approached the RTA seeking change of one route. 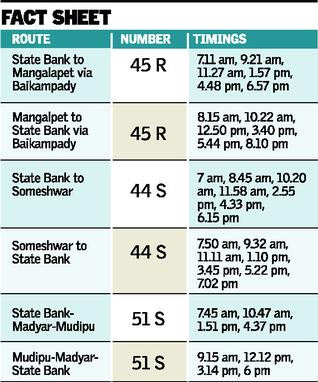 Some of the other routes in the pipeline from State Bank of India bus terminus are Car Street- Ganeshpura- Katipalla- Kaikamba; Gurupura -Kaikamba; Pilikula; Moodushedde; Shakthinagar; Mukka; Car Street- Kunjathbail; Talapady; Kinya; Faisal Nagar and Bajal church. The low-floor buses will be especially useful for senior citizens. They will have digital destination display boards and automatic doors in the front and centre. The official said the buses will have voice-based stop information system. The official said the buses to be operated will be one and one-and-half year old as they were plying in Mysuru city. They would be replaced with new buses after a few days once the fleet arrives. The KSRTC has decided not to wait for new buses as it will deprive the services to people. Buses to Bhatkal : The official said RTA, Udupi, has permitted the KSRTC to operate Volvo buses between Mangaluru and Bhatkal via Udupi and Kundapura. It has granted permission to operate nine buses. Timings are yet to be allotted.